EMT 140, Software algorithmic reverb from Universal Audio in the UAD Plug-In series. loudfunk's review"My absolutely have Reverb plug..."
Universal Audio’s uncanny representation of that unmistakable sound can be found in the EMT 140 plug-in. Measured and analyzed by UA’s DSP circuit modeling experts and then tuned by ear over a four month period, the EMT 140 replicates the sonic signature of three uniquely different EMT 140s for- merly installed at the Plant Studios in Sausalito, CA. That’s nearly two thou- sand pounds of sound in one plug-in! 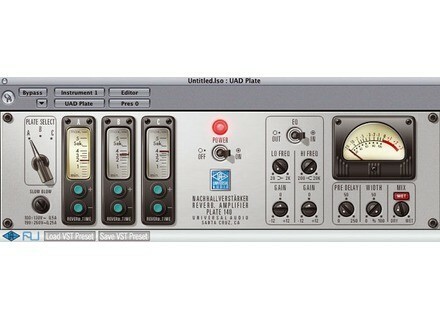 Impractical or impossible for most be- fore, Universal Audio brings this classic mix tool within the reach of everyone. Licensed and endorsed by EMT Studiotechnik GmbH as the world’s only au- thentic plate reverb emulation. The Input Filter is a dedicated equalizer that is used to re- duce low frequency content in the reverb. On hardware plate systems, this setting is rarely modified because it is found at the plate amplifier unit itself and is not easily ac- cessed from the control room. EMT 140 contains two types of filters: original EMT elec- tronics and Martech electronics which was/is a common plate system retrofit. In the modeled source units at The Plant, plates A and B use the EMT electronics while Plate C utilizes the Martech elec- tronics. In EMT 140, you can use either filter type with any of the three available plates. tion: –4 dB, –10 dB, and –16 dB. In controls mode, these values are prefaced with an “E” to designate the original EMT electronics model. The Martech filter (indicated by red text) is a shelf filter, therefore all frequen- cies below the frequency are reduced. Six shelving frequencies are available: 90 Hz, 125 Hz, 180 Hz, 250 Hz, 270 Hz, and 360 Hz. In controls mode, these values are prefaced with an “M” to designate the aftermarket Martech electronics model. Plate reverb systems are extremely simple: A re- mote damper setting, and a high pass or shelf fil- ter found at the plate itself. Additional manipula- tion is often used, including reverb return equalization, which is typically achieved at the console. Predelay is/was often achieved when necessary with tape delay, sending the return to a tape deck. Different tape speeds allowed dif- ferent pre-delay amount. Each setting is a model of a completely separate and unique plate system. Three 140’s for the price of one! I cannot mix without this any more. Unless I use the EMT 250. Xadovitch's review (This content has been automatically translated from French)" Superb"
Everything is clear and easy. It runs on a UAD card. it still eats a lot of card resources. Is a beautiful reverb easily editable. It is even the finest and most natural I have ever heard in soft (and I've already tried the flat plug Native Lexicon). Of course, this is not a general reverb so you'd better also have others (like spring, room, etc. ...).